I happened across a craft-related TV documentary series from the ’70s. The first episode I watched, embedded below, is an interesting look into Ireland’s spinning tradition, which is surely much less prevalent now. This particular episode was filmed in 1978 in Kilcar and Carrick, Ireland. This series has other awesome episodes, like Irish Spinningwheel Making, Donegal Weavers, and Donegal Carpets. I’ve been thinking of taking a ceramics class. I got my feet wet during college, and really enjoyed it. 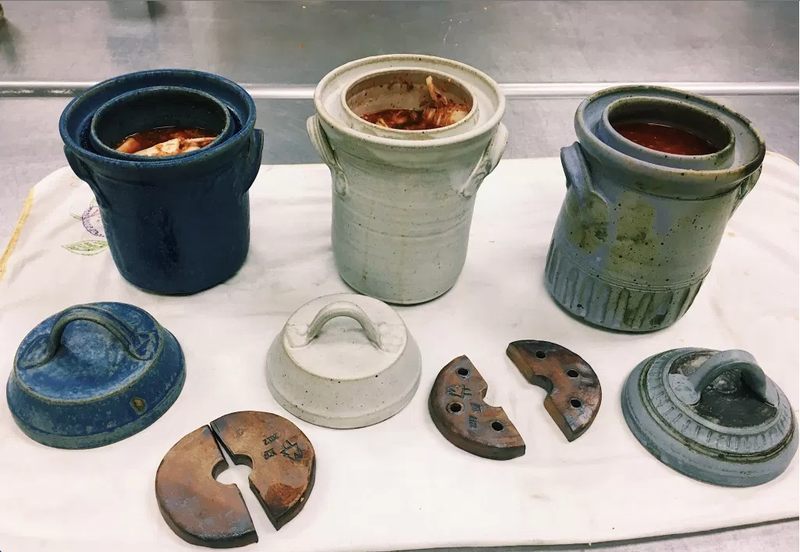 It’s amazing to think that you can make all your cups, plates, bowls, and more yourself! You could even make your own toilet. I’m especially interested, though, in making onggi, which are traditional Korean fermentation vessels. Here’s a video on how they’re made. Apparently the type of clay is very important, and detailed information is probably only available in Korean. I’d be satisfied with something like these crocks, which are also pretty and functional. From this site. Look at those weights! They help keep all of your ferments submerged. I also could make a donabe (see Toiro Kitchen for more info. The cookbook by Naoko Moore on donabe cooking is also quite good). And, well, a ceramics class just sounds fun. I like learning new crafts! Our sake has been fermenting for almost three weeks now. It’s looking pretty good! The remaining experiments smell strongly of alcohol. 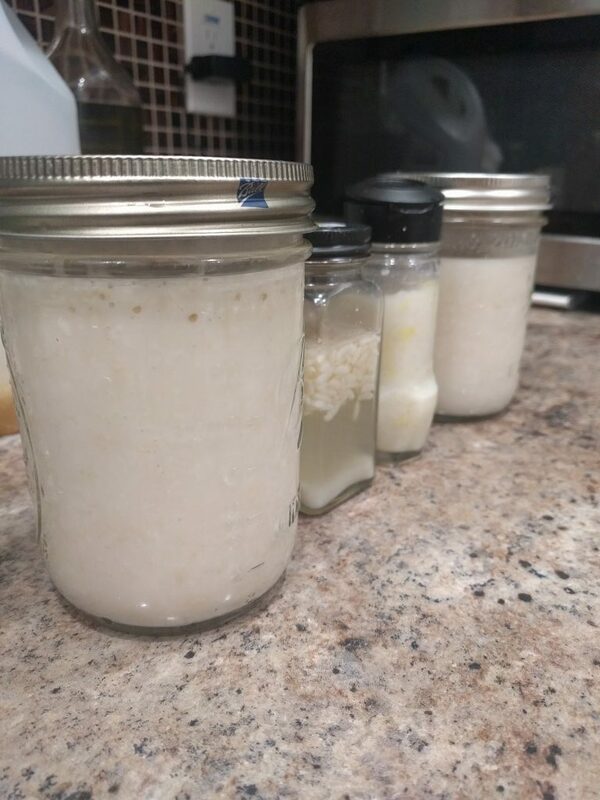 In order from left to right: rice + koji + bread yeast + brown rice syrup, rice + barley malt soaking liquid + brown rice syrup, rice + ginger + brown rice syrup, rice + chewing + brown rice syrup. As I discussed in the planning post, you can use different sources of amylase to digest the rice. 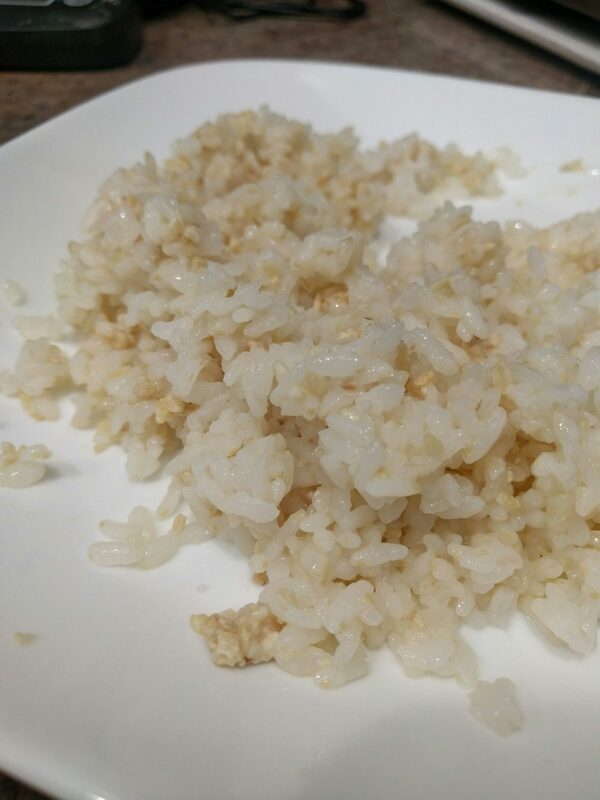 Koji works really well, chewing/saliva is fine, barley malt is less than desirable, and ginger doesn’t work (at all, as far as I could tell). The brown rice syrup, which started fermenting unaided in the cupboard, was added to provide a wild strain of yeast. A close up of the koji one. The bubbles of CO2 from fermentation push the bigger bits of rice up to the top. After taking these pictures, I threw away the ginger one. It wasn’t rotting, but it didn’t seem to be doing the right thing either. A few days later, I also threw out the barley malt one. 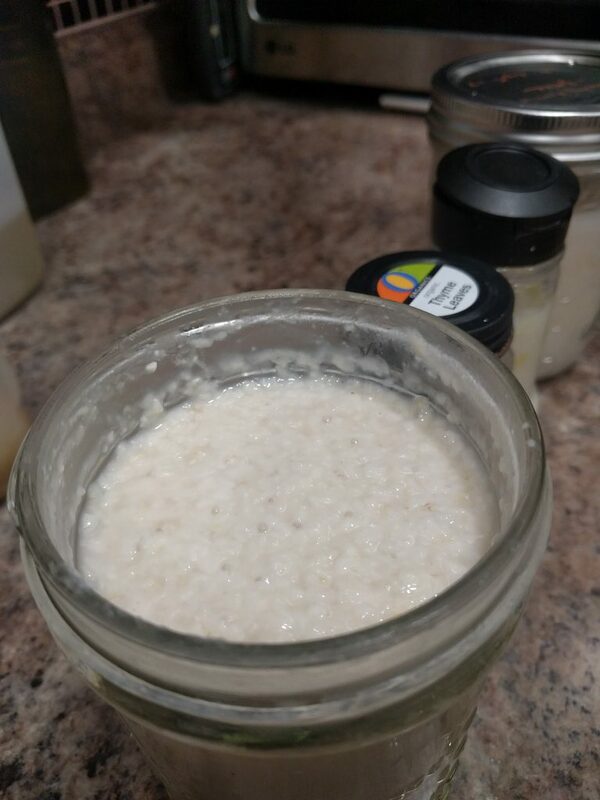 It had a weird skin on the surface, maybe kahm yeast? So I’m left with the koji experiment and the chewed experiment. Fortunately, they both smell strongly of alcohol. I hope they’ll be done soon (how do I tell when that is?). I may add another batch of rice to each. Doing this can push the alcohol content higher than it would otherwise be, since having more food available can trick the yeast into fermenting more. Friend V from college is interested in sampling the experiments, including the chewed one! Yay! I thought I would be the only one trying it- it’s my saliva, after all. I made danmuji, Korean yellow pickled radish, about a month ago. It’s supposed to sit for a month before being used, so this is the initial review! 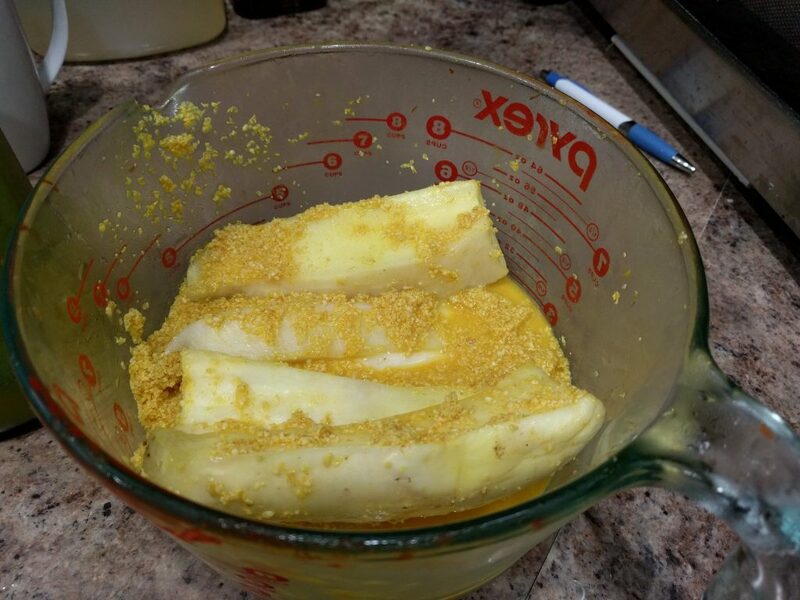 I used Maangchi’s recipe, substituting oat bran for rice bran, and turmeric for gardenia fruits. Apparently, gardenia fruits are edible. Who knew? Gardenia is used as an ornamental, so maybe you could forage for them. The fruits aren’t supposed to taste like much, however. Much like turmeric, they’re mainly used for their yellow color. The rice bran was supposed to add a “complex flavor”. I’m not sure if the oat bran was a good substitution in this case. But it doesn’t seem to have done any damage! Initially, there were too few jars, so I let it age in this lovely bowl. During the resting period, the radish ferments, according to Maangchi. However, I’m not sure if this is correct. 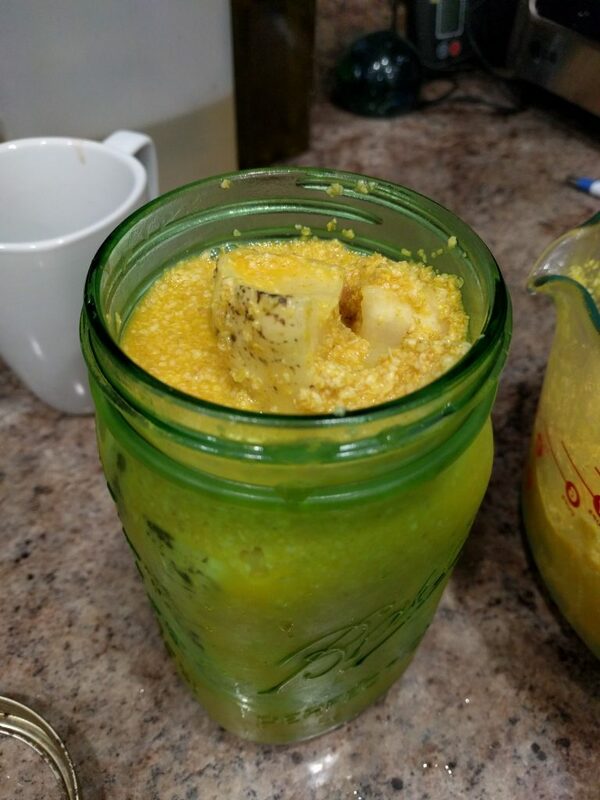 The radish is supposed to be stored in the fridge, so it wouldn’t ferment very fast. And you add vinegar directly to the brine. 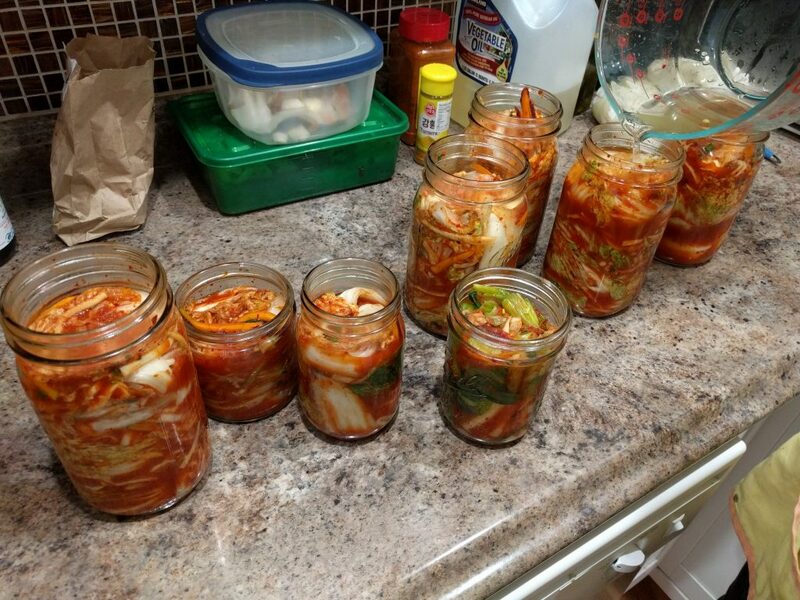 In normal lactic acid fermentation, such as in kimchi, the brine becomes sour over time due to lactic acid buildup. 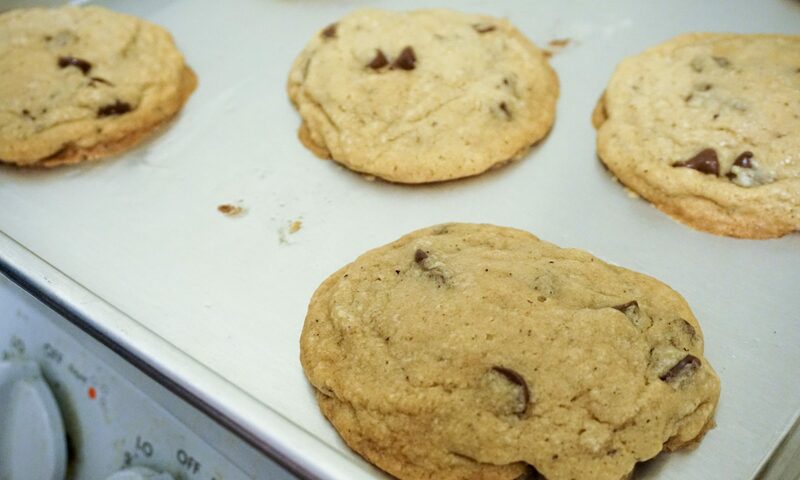 There’s no need to add vinegar. So I believe that the radish is simply being pickled. That said, perhaps it is supposed to be fermented; while good, the radish that I ate didn’t taste like commercial danmuji. 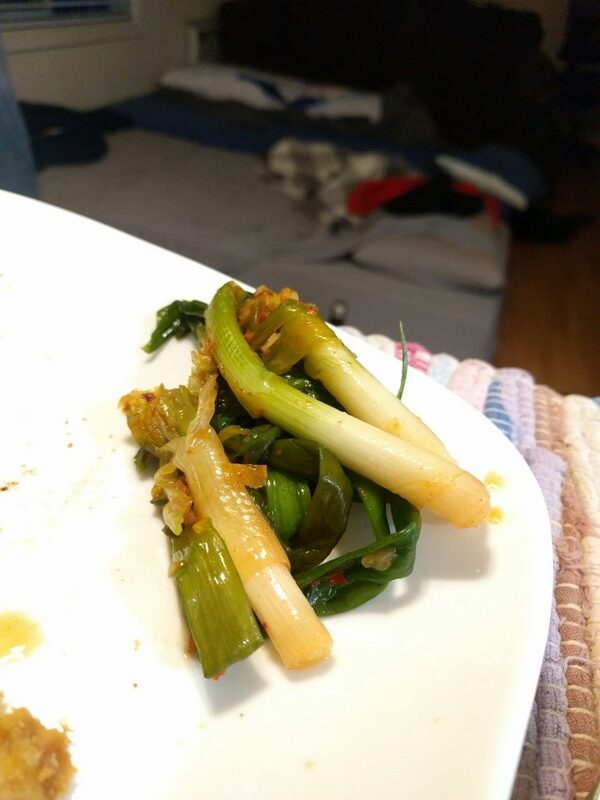 It is crispy and vinegary, of course. There’s a very strong funky radish smell and flavor. J thinks it smells like rotting or maybe rotten meat, but I really just think it smells like radish. Delicious! 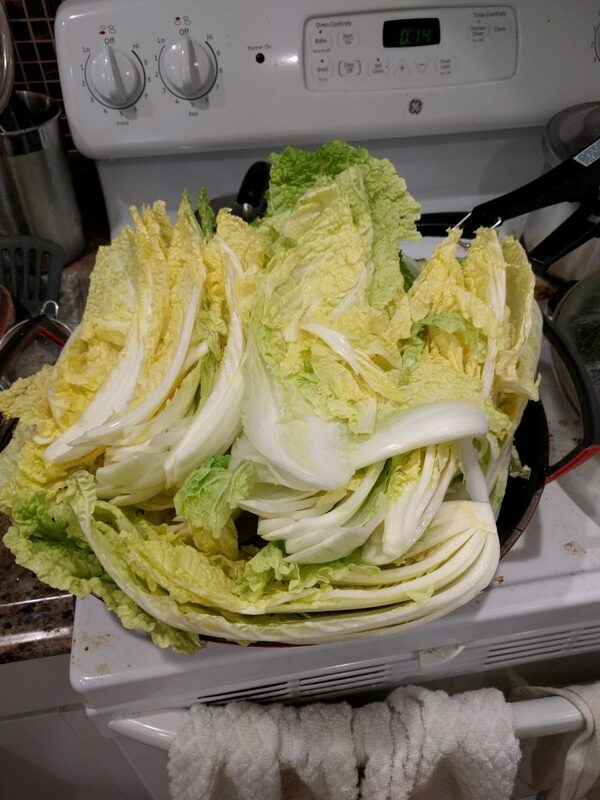 Even compared to kimchi, this was an easy recipe. You should try it! After lacing, I cut the string so that every desired tuft location had two string ends on the top of the mattress. 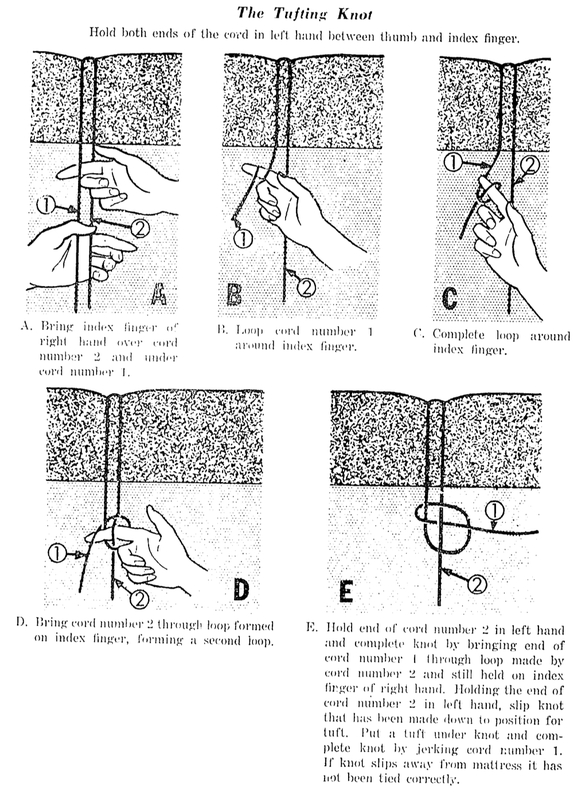 I loosely tied the ends with a special tufting knot, as described in How to make a cotton mattress. This knot isn’t hard, but it’s easy to tighten it wrong so that you have to completely untie it and start over. Before tightening the string fully, I placed rolled up pieces of cotton sliver on the top and bottom of the mattress underneath the string. This helps prevent the string from ripping through the fabric of the ticking (mattress case). This part was really hard. You have to tighten the string a lot, and each knot has to be tightened the same amount. Otherwise your mattress will be lumpy and uneven. It took me several days to finish this part. My fingers were so sore!! Finished! I’m not sure what to do about the strings. If I need to adjust the tension of the tufting, I need to keep the strings long. I’ll probably try the mattress out for a while, then decide whether or not I like the thickness/tension. The final mattress is fine. It’s not amazing, but it’s definitely sufficient. It’s pretty firm, as expected. Unfortunately, there’s very little spring. Maybe I should have added a thin latex core. I hear latex is excessively springy, enough that it’s not usually used alone. 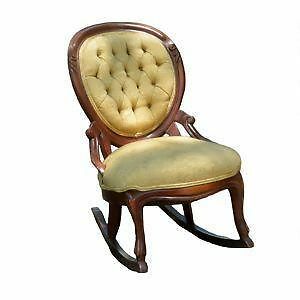 A Victorian rocking chair. Notice the gathers on the backrest of the chair. Those are tufts. Image from eBay. After stuffing the mattress, you need to lace and tuft it. In a mattress, tufting compresses the stuffing to give it a specific feel (for wool, springier and firmer). It also helps hold the stuffing in place. If a wool mattress isn’t tufted, then as you sleep on it, the wool will tend to shift to the edges of the mattress, leaving you in a ditch. And you need to lace before you tuft. Why am I making a mattress? I’d had my eye on Holy Lamb Organics wool mattress for a long time. It seems like a great company. They use organic cotton and organic/sustainably sourced wool. But the mattresses only come in 4″ and 5″ thicknesses (seemed a bit thin for my then-tastes) and are fairly expensive ($1300 or $1600 for twin XL, depending on thickness). So I started doing more research into sustainable and some conventional mattress options. I found several other (seemingly lesser) brands, and then I came across DIY Natural Bedding. This is a company that supplies the parts for people to assemble their own mattresses and other bedding, like comforters and pillows (!!!!). So cool!! And almost all of the parts are sustainable. For example, all their fabric is organic cotton, grown and milled in the US. The wool is basically organic (not certified, but still sustainable).Their latex is organic. They also do custom work, e.g. for furniture. The DIY Natural Bedding website is rife with inspiration. I figured if I were going to assemble the mattress myself, I might as well go all the way and make the parts myself too. You know I love crafts! I decided to make a wool mattress, as opposed to latex, for a few reasons. Wool can be raised domestically; latex comes from rubber trees, which only grow in tropical regions. The latex from DIY Natural Bedding, in particular, is from Sri Lanka, which is far away. Latex mattresses last a long time (30 years! ), but wool lasts even longer (100 years!!! !, with some maintenance). If I ever decide to dissemble my mattress, it would be easier to repurpose wool than to repurpose a rectangular chunk of latex foam. I am absolutely certain that wool is biodegradable; I’m not sure about latex. Lastly, wool mattresses are traditional. I know, I know, not a great reason. But I am solidly part of the modern reskilling movement, and think that it’s important to preserve traditional crafts. 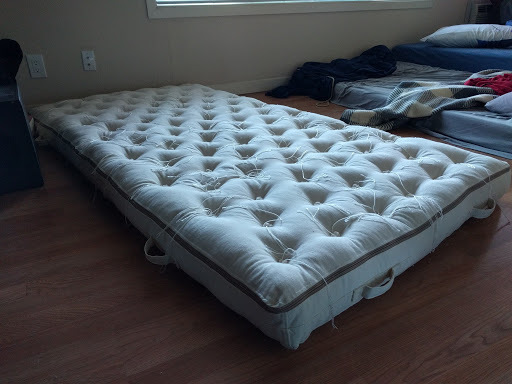 How to make a cotton mattress is an old document I heavily relied on for construction ideas. Here’s a cute story about how long wool mattresses last. Here’s another cute story.